But how can anyone deduce what an artist "intends"? For one thing, the artist may not have "intended" anything at all, may just have let something happen and assume its own form. Second, if the artist has a predetermined "intention", s/he may not have achieved it, so the work immediately becomes misleading. Third, since we all perceive reality in different ways, the "intention" theory asumes that there is a "right" way and a "wrong" way to interpret and react to a work. While reactions may be more or less intelligent, sophisticated or well-informed, surely they cannot be right or wrong? Quite a lot to think about. The first point, yes, I agree that the artist may not have intended anything at all. But would you not agree that that in itself would be a valuable thing to know? It's not so simple though, and even the first part alone of your comment opens up a whole lot of issues that I need some time to chew on. Right, here's a more considered response. I'm afraid it's long. Yes, absolutely, I totally agree, and I believe a lot of art happens like that. But I believe too that it matters who’s letting it happen and what their deepest motives are, not to mention their experience and skill. We are thinking beings after all, and even something that “just takes its own form” may be a highly sophisticated exploration of colour and psychological meaning, the brain behind the brush so to speak, as in the case of Paul Klee. At the other extreme you have Rorschach blots and abstract paintings by monkeys, and I heard one not long ago about a paintbrush tied to a donkey’s tail, etc etc. In short, I believe that it is possible to get a sense of the artist’s intention; it’s a question of knowing what to look for and sifting the evidence. For instance, finding something in a picture for which there’s no reason could be a clue that the artist might just have been filling space. The actual pictures are the best evidence and they continue to be available after the artists are dead and gone. But I’m no expert, I’m just struggling along like everyone else in a sea of images that gets more bewildering all the time. From my personal experience though, I’ve found that keeping the artist’s intention firmly in view, i.e. trying to figure it out, is the most useful strategy when looking at pictures. Second, if the artist has a predetermined "intention", s/he may not have achieved it, so the work immediately becomes misleading. This is a very good point. To put it another way, you can’t know if an artist has achieved his or her intention unless you know what the intention was to begin with. However I don’t agree that if the artist doesn’t achieve it the work becomes misleading. We’re talking here about the viewer and his or her interpretation of a work, so if a viewer gets misled it means he or she didn’t have a proper handle on the artist’s intention in the first place. It’s a sort of self-check. If one diagnoses the intention correctly then everything tends to fall into place, and one can confidently say, he was trying to do so-and-so and didn’t quite achieve it. Research might be needed to get to this point. The best example I can think of is Robert Hughes on Jackson Pollock in his Penguin collection of essays, Nothing if Not Critical, where he talks about Pollock, with all his drawing inadequacies, discovering that he could throw lines of paint in the air. Since we all perceive reality in different ways, the "intention" theory assumes that there is a "right" way and a "wrong" way to interpret and react to a work. I don’t agree that “intention” has anything to do with right or wrong. It is simply what someone is trying to do, and as far as I know it’s a neutral word. I do agree that there is no right or wrong way to react to a work and that variation in people’s responses to images is a fact of life. However, rereading your comment, I see it could be interpreted in another way, i.e. maybe you mean “right or wrong” in the sense that, if the artist had intention “A”, and the viewer interprets it as intention “B”, then the viewer is wrong … well, yes, I think I subscribe to that view. Originally posted 8/27/2006 10:32:48 PM, reposted this morning with minor edits. I was hoping the discussion would continue since JT’s comment opened up all sorts of interesting issues. For instance, in that last paragraph I’m seeing a distinction between “react” and “interpret”. How one reacts to a picture is an emotional thing over which one has no control, whereas how one interprets it is a function of knowledge and reason. That could move the matter forward, because you could now pose the question, does knowledge about a picture affect how a person reacts to it? It seems to me that as soon as you start talking about an artist's "intention", you are in some way prescribing a "correct" or "authentic" way of reading that picture (or book, or piece of music). I've personally never found that a helpful way of reacting to art (and those exam questions which say "What do you think was the writer's intention" or "What was the artist trying to achieve" have always driven me to rage). I can try to capture andd describe effect, but how can I possibly decipher intention? Of course there is bound to be intention at a basic level ("I'd like to write a novel about dentures, or paint a picture of eternity, or write a song about hate" – here goes). But when the work is done, and you are faced with a complex mass of words or notes or brush-strokes and colours, and the artist is forced to let go of the work and allow it to be independent like a grown child and assume its own identity, I think intention has been left far behind. And even if it hasn't, I would despair of trying to find out what it was, and of assessing a work on that basis. There are simply too many ways of experiencing and perceiving, and I don't think artists on the whole are saying "Now there is one authentic way of seeing this, in line with my intention, and the rest aren't really valid". One reason why this interests me so much is that I can do fairly well "reading" books and music, but seem to be largely blind when it comes to visual arts. I've found "intention" unhelpful as a way of getting a handle on a piece of work, but can't find an alternative. It’s true, I do think there’s a “correct” way of reading a book or a picture (music is beyond me). Furthermore, (though I hope it causes you no distress), I think that when a person gets a book or picture “right”, the solution/interpretation will very likely apply to other works by that writer/painter. Thus, to me, close study of pictures is akin to science, in that repeating the “experiment” with another work may support the first conclusion. If it didn’t, I’d wonder whether my first line of reasoning was wrong. It could be that this kind of thinking about pictures is valid only with certain kinds of questions. The kinds of questions I have asked myself which have got results have been specific rather than general, such as, “Why did Cezanne put the pedestal of that fruit dish off centre?” So we may in fact be talking about different things. Apart from that, there’s a funny thing about pictures: you see them and take them in in one instant, and yet it may take years to know what is in a given picture. So that I think painting, the visual arts in general, is a field where gains in understanding are made slowly, one artist /one picture at a time, little by little, using every available tool – the actual works, reproductions, existing interpretations and criticism, biographies, monographs, while keeping a firm hold on one’s own feelings/opinions. Personally, I stick to artists that I like. As I look back over what you wrote, I see that everything you say is true and indisputable and that you are taking an exceptionally long and broad view. So I will put forward a specific small example as an alternative. 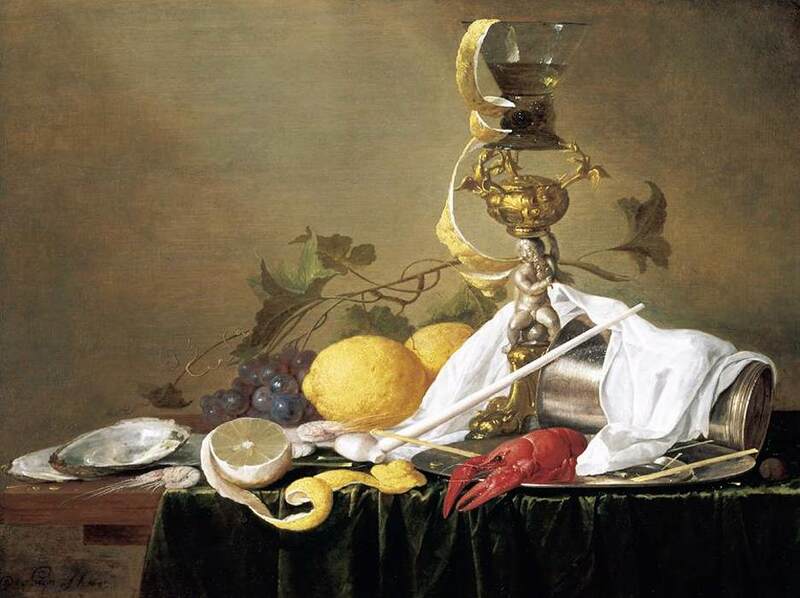 I maintain that it is possible for an artist’s intention (or part of his intention) to be as simple as wanting to show that one object is in front of another, as in this 17th C Dutch still life by De Heem. That is, at the nuts and bolts level, which looms very large to the painter. That’s part of the trouble maybe, that several levels of thinking are in operation during the execution of a work like this. Wow! This is a fascinating discussion and some of it so deep that I'd need to re-read it and think hard about the points made. This topic has made me think about the way I work (I'm an art student not an accomplished artist). Sometimes I start with a clear intention but as I get deeper into the subject, my ideas develop and change. Sometimes the new ideas are improvements, sometimes not and sometimes my explorations take me off in a different direction. Often I don't understand where these ideas come from, and the more I practice 'Art' the more convinced I am that my subconscious is taking over and my conscious intentions are getting pushed aside.